I wish I could take the credit for this clever idea, but all the credit goes to the couple who commissioned me to do this painting. They were having a large flat-screen TV installed in a wall in their home and thought it would be something of an eyesore to look at all the time. They hit upon the idea of covering it with a painting which housed in an unusual frame. The frame is mounted on roller glides, and the painting is split down the middle, so you can just pull it open from the sides to reveal the TV recessed in the wall. 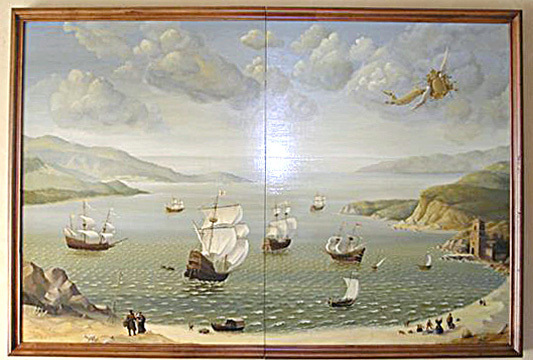 Their home is in Pebble Beach and the bay that's depicted in the painting is what one sees when looking out the window in the room where this was installed. They are both very interested in history and thought it would be fun to show that familiar bay the way it might have looked 300 years ago. I studied other marine landscapes from the 1600s and found several that had these very oddly stylized waves. So we used the waves and I learned what flags the Spanish ships to sail up the coast of California were flying and painted those in as well.